For your nameâ€™s sake, O LORD, preserve my life! In your righteousness bring my soul out of trouble! It is my favorite Psalm, second only to Psalm 119. It covers so many subjects: desire for audience; desire for mercy; sorrow because of opposition; depression; being comforted in remembering when the LORD has helped! ; desperate reaching for God; yearning for him; desire for guidance; desire for deliverance; desire for holiness and leading; stronger desire for deliverance; assurance of deliverance--why? Because we are God's servants. I read this passage around a week ago and was immediately struck by the amazing promises in these three verses! Death has no power over us! Our sinful and broken bodies will not remain as such forever, but God will be replacing them with something better--with something eternal--which can never perish and can never be passed away. Why then should we fear death? Do not we know that after death we will be given perfect bodies? Why then should we fear it? Death's sting has been removed because of the amazing work of the resurrection of the body of Christ, who conquered death for us so that we might not be slaves to sin any longer. I read Proverbs 10 this morning as part of HBRS (Horner's Bible-Reading System). I just realized how many references there are to SPEECH in this chapter. Verse 6: Blessings are on the head of the righteous, but the mouth of the wicked conceals violence. Verse 8: The wise of heart will receive commandments, but a babbling fool will come to ruin. Verse 10: Whoever winks the eye causes trouble, but a babbling fool will come to ruin. Verse 11: The mouth of the righteous is a fountain of life, but the mouth of the wicked conceals violence. Verse 13: On the lips of him who has understanding, wisdom is found, but a rod is for the back of him who lacks sense. Verse 14: The wise lay up knowledge, but the mouth of a fool brings ruin near. Verse 18: The one who conceals hatred has lying lips, and whoever utters slander is a fool. Verse 19: When words are many, transgression is not lacking, but whoever restrains his lips is prudent. Verse 20: The tongue of the righteous is choice silver; the heart of the wicked is of little worth. Verse 21: The lips of the righteous feed many, but fools die for lack of sense. Verse 31: The mouth of the righteous brings forth wisdom, but the perverse tongue will be cut off. Verse 32: The lips of the righteous know what is acceptable, but the mouth of the wicked, what is perverse. 34 And when he had called the people unto him with his disciples also, he said unto them, Whosoever will come after me, let him deny himself, and take up his cross, and follow me. 35 For whosoever will save his life shall lose it; but whosoever shall lose his life for my sake and the gospel's, the same shall save it. 36 For what shall it profit a man, if he shall gain the whole world, and lose his own soul? 37 Or what shall a man give in exchange for his soul? Deny yourself. Whew. That takes a lot of courage and self-control, doesnâ€™t it? Yet that is exactly what Jesus did when He came down to earth. He is the one that created the people that tormented Him on the cross. I am sure that Jesus felt a huge desire to use His power and stop the people from doing this awful thing to their Creator. Yet, even though he could have called twelve legions of angels down from heaven, (Matthew 26:53) He denied Himself in order to save us. Denying ourselves means giving up to the Lord our rights, our expectations, our dreams, even our lives if we have to. If you deny yourself for the sake of Jesus, you will be saved. This comes from a newsletter that our family started several months ago. 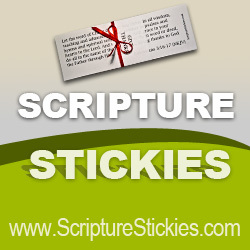 I write a "Scripture of the Month" every month for it. This is the one for September. If you like, I can keep posting the Scripture of the Month here. Yes, Matthew, we would love your thoughts on your Sripture of the Month here. We would also love everyone else's meditations on Scripture that you memorized or read that had an impact on your life. It is always inspiring to hear from people who love the same Scripture I love, and twice as exciting when people love Scripture I had not yet considered worth loving myself. Matthew, being newly married after being largely independant for most of my 43 years of being single, I have a brand new appreciation for the self-control needed to truly express love and put others first. I trust I will be able to use what I am learning in loving Jacky to more fully love the Supreme love and lover of my soul, who as you powerfully shared, showed extreme self-control in loving and saving me. 8 "Would you discredit my justice? Would you condemn me to justify yourself? 9 Do you have an arm like God's, and can your voice thunder like his? 10 Then adorn yourself with glory and splendor, and clothe yourself in honor and majesty. 11 Unleash the fury of your wrath, look at every proud man and bring him low, 12 look at every proud man and humble him, crush the wicked where they stand. 13 Bury them all in the dust together; shroud their faces in the grave. 14 Then I myself will admit to you that your own right hand can save you. How arrogant we can be sometimes. Have you ever said to God, "Why are You doing this? If I were You, I sure wouldn't do what You're doing to me!" I have said things similar to that many times. But how can we think that we know more than God? He created the universe, of which we have only begun to scratch the surface. He has created everything with extreme vastness, and yet has kept everything beautiful and orderly to the very least detail. He judges the wicked and the righteous justly, and knows exactly what He's doing. He planned everything out from eternity past (He's known this forever), and He has promised that everything will turn out for good for those who are in Him, no matter how little we understand it at the time. Telling God we could do better is the most arrogant thing we can do--and yet isn't it amazing that, no matter how many times we do it, He loves us the same amount as He always has? What's even more amazing is that He chose us to be His children knowing all the sins we would commit even after our salvation. We truly serve an amazing God. He "is gracious and compassionate, slow to anger, and abounding in love". If you had the ability to create something like that and your creation was so sinful against you, would you have such compassion and grace? Certainly not, at least not me. God's patience and mercy is so great--beyond our comprehension. We can't even begin to fathom Him, and yet He loves us so much, enough to become one of us and die for us. May He give us strength to serve Him with all our heart, soul, mind, and strength. The passage goes on like this for the entire chapter. God is the most incredible being imaginable. Omnipotent, omnipresent, omniscient, ever-gracious, perfectly just and righteous, holy beyond imagination, perfect in everything He is, says, and does, loving to those He chooses, showing common graces to everyone and saving grace to His elect, keeping His promises no matter what, and loving us more than we can imagine, much less deserve, when we have committed countless sins against Him. He has done much more than I can ever say in a simple comment, but at least I can get it across that He is infinitely amazing. His love truly does endure forever. We slip up, don't give Him the praise He deserves, and even shake our fists at Him so many times, but He loves us anyway. We deserve worse than our puny minds can imagine, and yet He loves us so much that He gives us rewards much more glorious than our puny minds can imagine. Funny how that works, isn't it? :) When He sent Christ to die for us, He paid a price beyond anything all our worldly money put together would do (technically, it's worthless anyway). The only reason He did this was because we had a debt that big. We are so sinful. We may think, "Well, I'm a pretty nice person. I think I could get to heaven." It doesn't work that way. We don't just outbalance our bad stuff with our good stuff. Since God is so holy, He can't have a drop of sinfulness in His presence. Our sins are like spilling a big can of ink on a perfectly white piece of cloth. God can't allow that. He allowed Adam to fall into sin so that we would become sinful so that He could save us so that He would be glorified. "Well, I don't want to serve a God like that!" you may say. But really, what right do you or I have to say that? He DESERVES glory. Isn't it right that He finds a way to get it from us? And His plan is so gracious! He displays his unfailing, undeserved love in a way better than any one of us would have dared to come up with. God's love endures forever! Let's praise Him for that. Isn't that so true? Jesus Christ laid down the perfect riches of His kingdom in heaven to come down to earth, a planet cursed by sin. He did not lay down His part in the Trinity, but He came with flesh, blood, and feelings to earth as a child in the womb of a sinful human, fully God, and yet fully man. He endured the pain, sufferings, and temptations of humans, yet never sinned. After about thirty-three years bound by human time, He accomplished what He came for. "He was despised and rejected by men, a man of sorrows, and familiar with suffering. Like one from whom men hide their faces he was despised, and we esteemed him not." He preached the truth to His chosen people, and they hated Him for it. They seized Him on Gethsemane, put Him in a lawless trial, and crucified Him. He suffered the full wrath of the Father for our numerous sins and died on a tree, bleeding, and in horrendous physical, spiritual, and mental pain. God turned His back on His Son, despising Him as He would have done to our sins. "It was the Lord's will to crush him and cause him to suffer". He made Himself poor so that by His poverty we might become rich. We have the gift of eternal life if we take it. He has made it so simple to receive His gift. We just need to turn away from our sins, hating them and what they did to our Savior, and put our trust in Him for eternity. That's a lot of trust, but He paid a big price. He, and He alone deserves our eternal praise and worship. He loves us so much, though we hated Him so much (and He loves us even more!). He is the only God who laid down His own life for His creation--therefore, He is the only One who deserves our everything. Let's serve Him with all we have and all we are for the price He paid for us. well-watered garden, like a spring whose waters never fail. 14 I am poured out like water, and all my bones are out of joint: my heart is like wax; it is melted in the midst of my bowels. 15 My strength is dried up like a potsherd; and my tongue cleaveth to my jaws; and thou hast brought me into the dust of death. 16 For dogs have compassed me: the assembly of the wicked have inclosed me: they pierced my hands and my feet. 17 I may tell all my bones: they look and stare upon me. 18 They part my garments among them, and cast lots upon my vesture. 19 But be not thou far from me, O LORD: O my strength, haste thee to help me. Take a moment to reflect on this passage of prophecy, written by David. It seems strange to have prophecy in the Psalms, but here it is! David is describing in detail what happened to Jesus on the cross, one thousand years before it happened. The Roman method of crucifixion was unknown to the Israelites then, but here is David prophesying it. How would David know about crucifixion hundreds of years before it began to take place? I think that the Holy Spirit moved him to speak these words (2 Peter 1:21). Even the gambling for His clothes was predicted clearly. The prayer in verse 19 is a prayer that is found throughout the Psalms. I believe it should be used by Christians when they are in trouble; not as a last resort, but as the first thing we think to do. We as Christians really should get back into the habit of praying more often. Matthew, great to read your October Scripture of the Month thoughts. I agree that this and ISAIAH 53 are 2 wonderful prophesies that can build our faith in the supernatural inspiration of the Old Testament, as well as in the Divine mission of Jesus, the Christ. I also appreciate your thoughts on prayer. Alethea and SavedbyGrace, I'm sorry I missed your thoughts when you first posted them. I especially love the devotional on JOB 40:8-14. I, too, have fallen into the trap of thinking God was not currently acting in as wise or loving a way as I could in the same situation. May we all learn from the book of JOB and join the historical Job in 42:1-6 in acknowledging that God is always right, loving, and wise, and He doesn't have to always appear so to our messed up perspective for us to have ample evidence and reason to praise and fully trust Him. Well, this was meant to be the Scripture of the Month for November but I can't seem to wait that long! It has so much to do with the Bible Bee, so if you are a National Qualifier, read this passage carefully! When thou art bidden of any man to a wedding, sit not down in the highest room; lest a more honourable man than thou be bidden of him; 9 And he that bade thee and him come and say to thee, Give this man place; and thou begin with shame to take the lowest room. 10 But when thou art bidden, go and sit down in the lowest room; that when he that bade thee cometh, he may say unto thee, Friend, go up higher: then shalt thou have worship in the presence of them that sit at meat with thee. 11 For whosoever exalteth himself shall be abased; and he that humbleth himself shall be exalted. Now what does that have to do with the Bible Bee? you think. It has more to do with it than you realize. Let me tell you what I mean. Last year when I qualified for Nationals, I studied pretty hard and sometimes wore myself out just studying all the time. I even did it against my will sometimes. So at the Bible Bee, I was proud and vain of what I had accomplished and was pretty sure that I would make it to Semi-Finals. Can you imagine my disappointment when my name was not called? (I'm sure many of you past Bible Beers can!) I was devastated. I'm not usually one to cry, but I cried myself to sleep that night. Skipping ahead to the present, I am again tempted to think I am doing pretty good with my studying; I wouldn't be surprised if I made it to Semi-Finals. That thought is from the devil. He wants me to become proud and vain about what I have accomplished. So what does that have to do with my Scripture? Well, I think that putting yourself in a high seat in Christ's parable is parallel to my putting myself in the mindset that I am going to win. That only gets you disappointment and shame. On the other hand, if you are ready to accept anything that happens (i. e. you put yourself in the mindset that you probably will not win - which is, in fact, true), if you are called, and I did say IF, it will be a pleasant surprise to you! Even if you do not make it higher, you will have the satisfaction that at least you made it this far. Whoever exalts himself will be humbled, and he that humbles himself will be exalted! I think God will purposely put the ones who choose to be humble up on that stage, so that they will glorify Him instead of themselves. Note: In this passage, "worship" is better translated "esteem" or "honor". Jesus is not encouraging human pride. @Matthew - I meant to comment sooner, to thank you for your thoughts, but I never got around to do so until now. It is definitely something we need to guard against...having thoughts like "I've studied really hard, I'm sure I'm going to make it to Semi-Finals" It is by God's grace if we make it that far, and if any of us make it to Finals. My dad has shared something with me and my younger siblings who also made it to Nationals. "The preparations of the heart in man, and the answer of the tongue, is from the LORD." - Proverbs 16:1. We need to prepare for Nationals, and work diligently in our studies, but it is from the Lord if he wishes to bless us. Go in with the attitude that Matthew shared - by being humble. There are plenty of commands in these verses, and I'll go through each one at a time. "To be subject to rulers and authorities." This is very hard sometimes. When we have judges, governors, presidents, etc. over us, telling us what to do like they are the head of everything, it gets rather frustrating. Yet God tells us to obey them unless it is sin, and to respect them at all times. That seems nearly impossible at times. And it's not just the "rulers"; it also includes "authorities." That means anyone who has a right to tell you to do something--bosses, fellow employees in a higher position than you, parents, and yes, even older siblings. Especially for someone at my age, where people put such low expectations on you, it seems like it's not a big deal to be a little rebellious. But it is, as we see here. "To be obedient." This means obeying what God and the aforementioned authorities tell us to do, as long as it is outside the boundaries of sin. Sometimes it's tough to decide whether something a government official is telling us to do is sin or not, but more times than not, we know what we should do, but don't do it. Or, we know what we shouldn't do and do it anyway. God is clear that obedience to Him and those He has set in authority is not optional, or we are disobeying Him. Yet it is so easy to disobey. "To be ready to do whatever is good." This is not a "do not," but a "do." It is easier for us humans to not do something than to actually do something. We could obey all the "do not"s by just sitting in a chair and doing nothing. But God commands us to do things. We are to always be ready to do something good. If we see something to be done, we should do it. If someone needs help, don't ignore it or pretend you didn't see them. Help them. There are innumerable applications to this command, but I'm sure we would all find at least ten things in a day that we could do for someone, yet we make up lame excuses for it. Don't make excuses; just do it! "To slander no one." This may be easier for some than it is for others, but we can all catch ourselves talking behind someone's back at some point. Somehow, it seems to build us up to tear others down. It's a very appealing trap to fall into. But the best thing to remember when you're about to share something slanderous about someone is to remember that you are the chief of sinners. (1 Timothy 1:15) We do not deserve to be calling anyone else something bad, when we are the worst it gets. Don't compare yourself with others' outward actions--judge yourself by God's law, and see how bad you really are. This will usually keep you from speaking anything but good about others. "To be peaceable and considerate." The idea of peace is starting to disintegrate worldwide. Although there is "a time for war," many conflicts are unnecessary products of man's sinfulness. Peacefulness is a hard concept to swallow, especially when it seems there is so much to fight about. But after the verse says to be peaceable, it says to be considerate. Again, bring up the idea of being the chief of sinners. Why would we be rude to someone whom we know we do not even deserve to be talking with, being as sinful as we are? Be considerate of others' needs and problems. Don't ignore what they are doing and go on with life as if nothing was going on. Many conflicts begin because someone got someone else angry because they were inconsiderate of the other person's situation. Try to make peace when there is fighting, and be considerate in order to prevent conflict. "To show true humility toward all men." This is probably the toughest one for all of us. Humans are naturally proud, and any accomplishment we achieve makes us want to tell someone about it. Usually this involves being inconsiderate of someone else, it does not involve doing good, and it is not obedient to God's laws. This goes against nearly everything I have described above. Humility is probably the hardest virtue to achieve, because it goes directly against our prideful nature. We always want to look the best, or at least better than someone else. But we must, by God's grace, get rid of prideful thoughts. God hates it, and it doesn't really do anything good for us. Sorry for being slightly confusing in that brief exposition, which I'm sure I was, but meditate on those verses. You probably don't need all of this explained to you. Just remember to be subject to authorities, be obedient, be ready to do whatever is good, slander no one, be peaceable and considerate, and show true humility to everyone. lol! that IS a long comment! :D but a good one ;) BTW did u type all that? And in that day thou shalt say, O LORD, I will praise thee: though thou wast angry with me, thine anger is turned away, and thou comfortedst me. 2Behold, God is my salvation; I will trust, and not be afraid: for the LORD JEHOVAH is my strength and my song; he also is become my salvation. 3Therefore with joy shall ye draw water out of the wells of salvation. 4And in that day shall ye say, Praise the LORD, call upon his name, declare his doings among the people, make mention that his name is exalted. 5Sing unto the LORD; for he hath done excellent things: this is known in all the earth. 6Cry out and shout, thou inhabitant of Zion: for great is the Holy One of Israel in the midst of thee. This, I believe, is the most beautiful psalm found in Scripture outside of the book of Psalms. Isaiah wrote this psalm right after he talks about the Branch that comes out of the root of Jesse in Isaiah 11. One thing I especially think interesting about this poem is that Isaiah says something about drawing “water out of the wells of salvation”. What exactly does this mean? I think that Isaiah is referring to the sign from God in Exodus 17, where God had Moses strike the rock and, miraculously, water poured out of it. I also like the fact that Isaiah says in verse 2, “…the LORD JEHOVAH is…my song…”. Notice he doesn’t say “the LORD is in my song” or “I sing about the LORD”. He says, “The LORD IS my song”! This is God’s intended purpose of music, to glorify Him and Him alone! Have you ever heard of a man named Jabez? His story is right smack in the middle of the longest genealogy in the Bible at the beginning of 1 Chronicles. Most people would overlook him. However, Jabez has a unique account, important enough for one to stop the monologue of the genealogy to say, “Hey, here’s something interesting about this man named Jabez.” It’s not every man you can do that with. And Jabez was more honourable than his brethren: and his mother called his name Jabez, saying, Because I bare him with sorrow. 10And Jabez called on the God of Israel, saying, Oh that thou wouldest bless me indeed, and enlarge my coast, and that thine hand might be with me, and that thou wouldest keep me from evil, that it may not grieve me! And God granted him that which he requested. Notice it says that he was more honorable than his brothers. Why? Bruce Wilkinson in The Prayer of Jabez says that it was because he prayed the prayer in verse 10. The prayer begins with “Oh, that You would bless me!” Asking God to bless us is not selfish as it sounds, but rather it is asking God to show Himself strong in our lives. Next Jabez says “Oh, that You would enlarge my coast [borders]!” This is asking God to extend our business and our ministry so that we can live for Him more powerfully. Then he asks God “Oh, that Your hand would be with me, and that you would keep me from evil!” The first two things Jabez prayed are things that most Christians today wouldn’t think of saying to God. Yet, God wants to hear those very words so that He can bless us bountifully. Do you like to be blessed? Just ask God, and he will grant what you request! And Jonah began to enter into the city a day's journey, and he cried, and said, Yet forty days, and Nineveh shall be overthrown. 5So the people of Nineveh believed God, proclaimed a fast, and put on sackcloth, from the greatest of them even to the least of them. 6For word came unto the king of Nineveh, and he arose from his throne, and he laid his robe from him, and covered him with sackcloth, and sat in ashes… 10And God saw their works, that they turned from their evil way; and God repented of the evil, that he had said that he would do unto them; and he did it not. This passage is a great example of the mercy of God when His people repent. However, there have been questions about the phrase in verse 10, where it says, “God repented… he did it not.” Can we change God’s mind? Can we adjust his will by ardent prayer and if necessary, fasting? The Bible makes it clear that God is unchanging. Hebrews 13:8 says that Jesus is “the same yesterday, and to day, and for ever.” Again, “I the Lord do not change” (Malachi 3:6). How, then, can God change his mind? 1Arthur Wallis, God’s Chosen Fast. Christian Literature Crusade. But he answered and said, I am not sent but unto the lost sheep of the house of Israel. 25Then came she and worshipped him, saying, Lord, help me. 26But he answered and said, It is not meet to take the children's bread, and to cast it to dogs. 27And she said, Truth, Lord: yet the dogs eat of the crumbs which fall from their masters' table. 28Then Jesus answered and said unto her, O woman, great is thy faith: be it unto thee even as thou wilt. And her daughter was made whole from that very hour. I have had a hard time understanding what Jesus said in this passage for a long time. I think I finally understand what Jesus was talking about when He said, “It is not meet to take the children’s bread, and to cast it to dogs.” Jesus was talking about the immoral woman that was speaking to him when he said “dogs”. He was implying to the woman that she was not worthy of the power that He had. It is interesting that He was just a moment ago saying to his disciples who were telling her to leave Him alone that he was sent to the lost sheep of the house of Israel. I believe He was purposely testing her faith before He healed her daughter. Notice the woman’s response. Jesus calling her a dog did not discourage her. Instead, she humbly implied a request of just a little bit of his power by saying, “The dogs eat of the crumbs which fall from their master’s table.” She had faith in Jesus. What a great faith! This woman was most likely a prostitute of the city. That a great rabbi would pay attention to her was unthinkable. Yet she had faith, and she was rewarded. Do we have that kind of faith? And if I go and prepare a place for you, I will come again, and receive you unto myself; that where I am, there ye may be also. 4And whither I go ye know, and the way ye know. 5Thomas saith unto him, Lord, we know not whither thou goest; and how can we know the way? 6Jesus saith unto him, I am the way, the truth, and the life: no man cometh unto the Father, but by me. 7If ye had known me, ye should have known my Father also: and from henceforth ye know him, and have seen him. 8Philip saith unto him, Lord, show us the Father, and it sufficeth us. 9Jesus saith unto him, Have I been so long time with you, and yet hast thou not known me, Philip? he that hath seen me hath seen the Father; and how sayest thou then, Show us the Father? Take an example from Thomas and Peter in this passage. If Matthew 6:9-13 is how to talk to God, this is how NOT to talk to God. Jesus is in the middle of a profound conversation with His disciples at the Last Supper. He is telling His disciples that He is going to prepare a place for them in His kingdom, and that they know the way to where He is going. Thomas reveals in his question that he did not truly know who the Christ was. Christ is the way to the Father. Jesus gently rebukes Thomas for his disbelief. It was not until Thomas touched the holes in Jesus’ hands and feet that he truly believed. Philip now demands to see the Father. He did not understand that Jesus and the Father are one. I do not believe that any of these disciples truly knew who Jesus was until He rose from the dead. He assured them repeatedly, but they did not understand. Would to God that we understand truly who Jesus is! May we always remember and show reverence to Him!